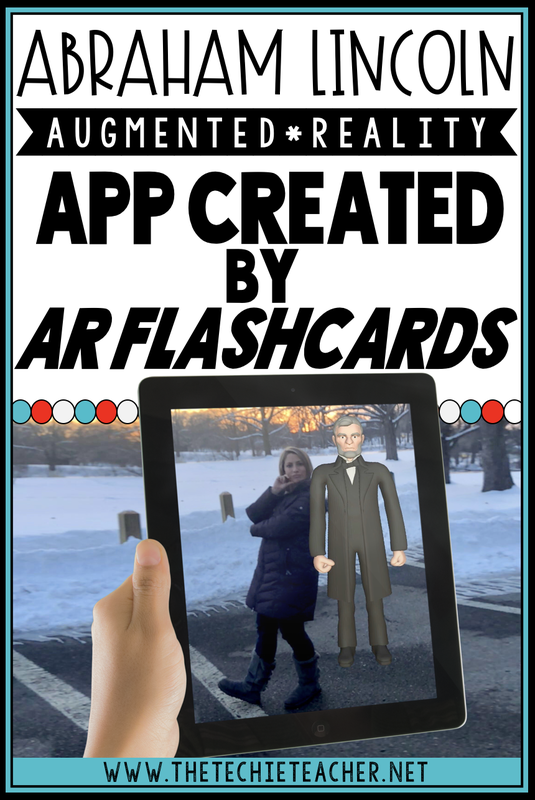 Abraham Lincoln Augmented Reality App by AR Flashcards | The Techie Teacher® . AR Flashcards just released their latest augmented reality app, Abraham Lincoln, that is available for iOS. (Coming to Android this week!) It is FREE with in app purchases. You can still do some neat things without purchasing any extras. You don't have to print anything. All you need is the app. This app is rated 4+ and requires iOS11 or later. The free version will gain you access to 4 doorways that will lead you to real places in Kentucky where Abe was born. You also get an animated Abraham Lincoln who will recite the Gettysburg Address with the tap of a button. Earn badges along the way! For $0.99 you can gain access to 5 more doorways in Indiana where Abe grew up. Even more content will be added throughout the year! Read more HERE. Students can jump into the frame with Abe or one of the locations and snap a picture. They could also do a screen recording of Abe reciting the Gettysburg Address. Students can add these images or videos to their projects about presidents, Abraham Lincoln, famous speeches, etc.. Younger children could upload their pictures to Seesaw and record themselves reading facts about Honest Abe! Julie, I saw this at the computer conference I attended! Love it. What a wonderful way to learn.